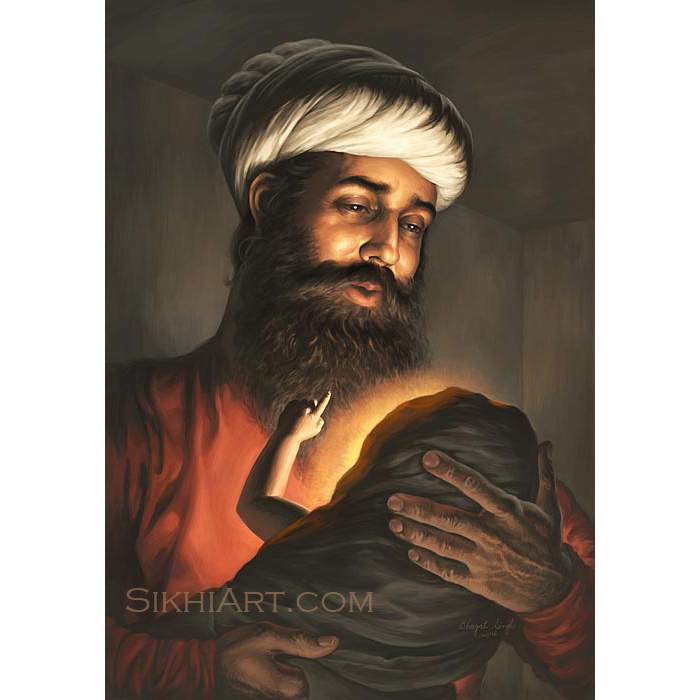 On the day of Vaisakhi, 1699, Guru Gobind Singh ji did the initiation ceremony a little differently. 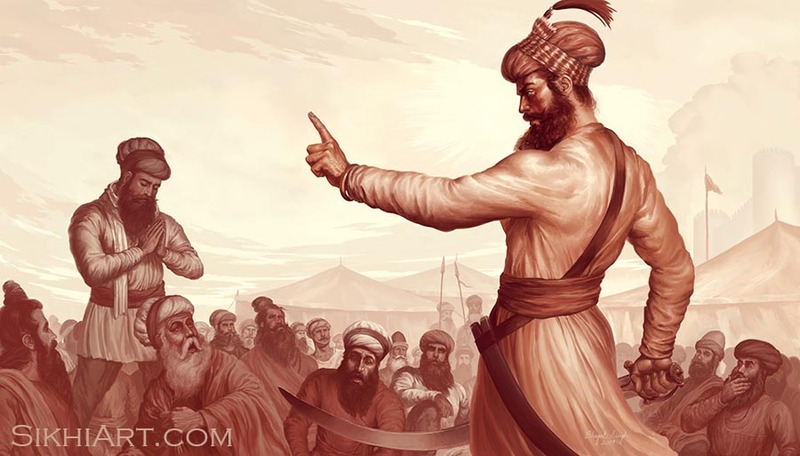 He called for his devoted sikhs to give up their heads while holding his glistening sword ready to behead them. Bhagat’s newest painting captures this critical moment in not just Sikh History but the History of Punjab, that changed the very face of the region and the people who lived there. 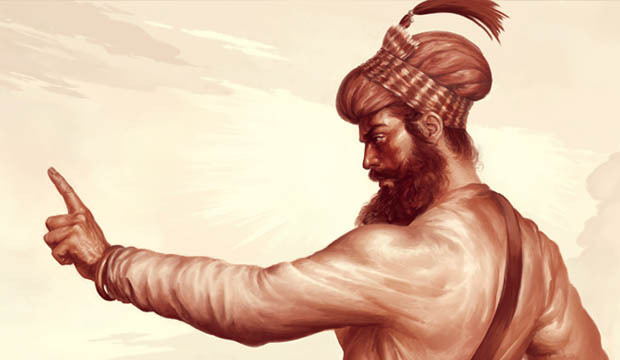 After the persecution and execution of Guru Arjun Dev ji and Guru Tegh Bahadur ji, Guru Sahib’s great grandfather and father, Guru Sahib wanted to inspire the warrior spirit in his sikhs so that they would be able to stand up to the oppressors and be able to defend themselves. So during the Vaisakhi of 1699, Guru Gobind Singh ji addressed the sangat that had gathered to listen to him. He said that great actions require great sacrifice, and with that he pulled out his sword and asked for one head. The congregation of sikhs were shocked. Some wondered whether the Guru was kidding. Some wondered whether the Guru had gone mad. 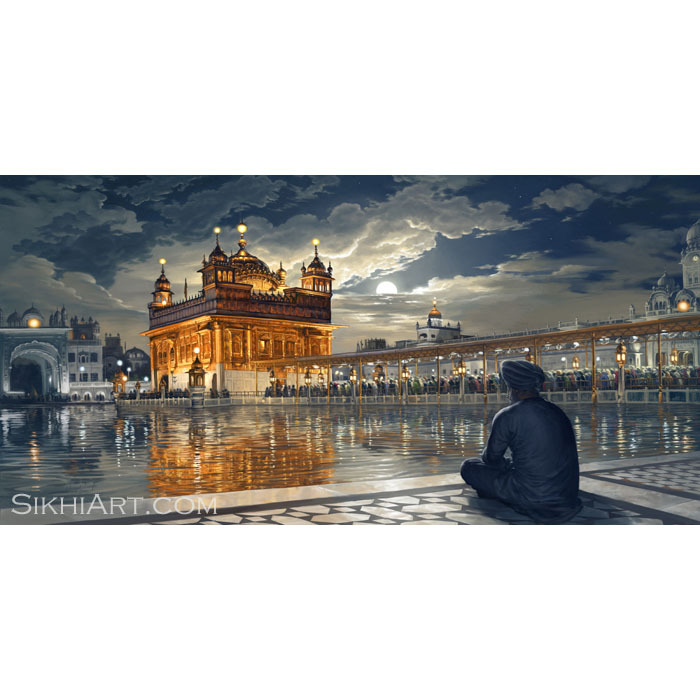 Guru Sahib’s request sent waves of fear and doubt throughout the sangat. However one brave man got up and offered his head to Guru Sahib. 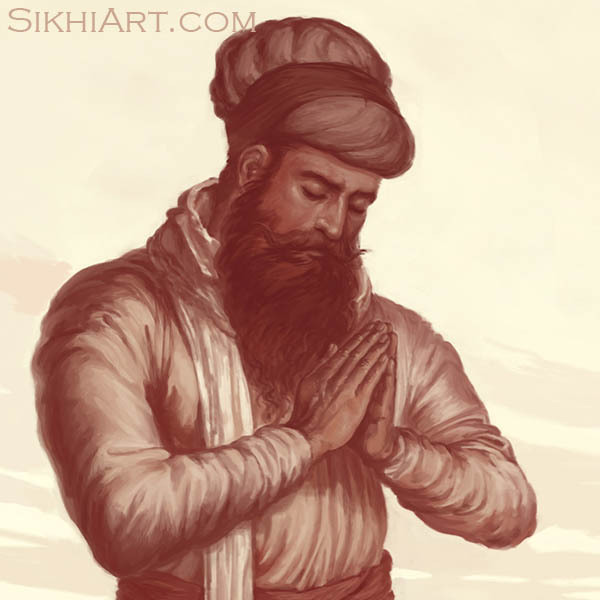 He bowed down and performed the namahskar to Guru Sahib with folded hands. 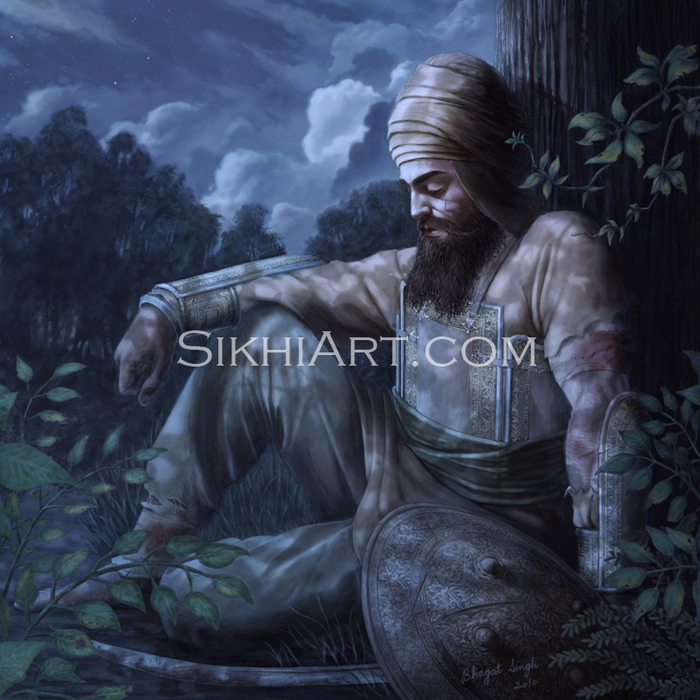 Guru Sahib took him inside the tent behind him. After a while, he came back out with his sword dripping with blood, and asked for another head. Again, another man got up and offered himself as sacrifice. This happened a total of five times. 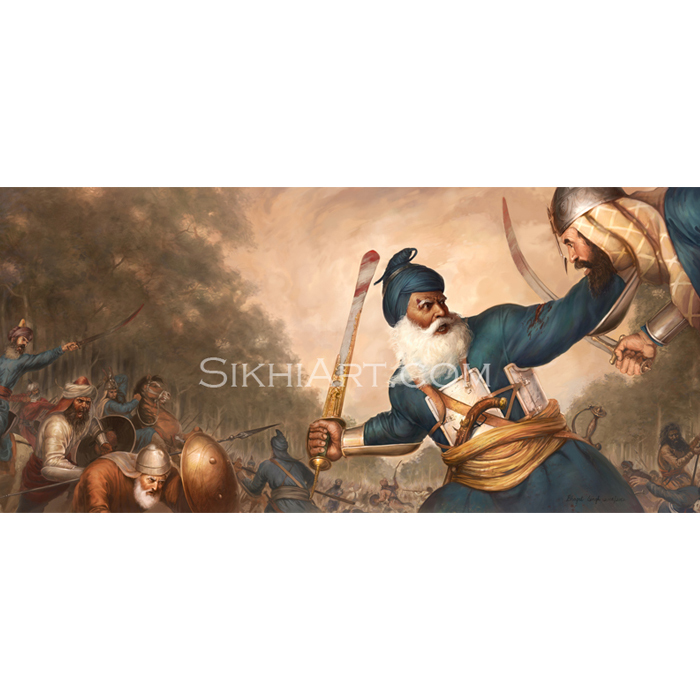 These five men who offered themselves up for sacrifice were known as the Panj Pyarey. Bhai Daya Singh ji, Bhai Dharm Singh ji, Bhai Himmat Singh ji, Bhai Mohkam Singh ji and Bhai Sahib Singh ji. Guru Sahib prepared them for the initiation ceremony. He asked for a cauldron full of water and a khanda sword and thereafter began to stir the water while reciting divine hymns over it. He added sugar to sweeten the water and offered this to the Panj Pyarey. Guru Sahib also requested that he be given the same. 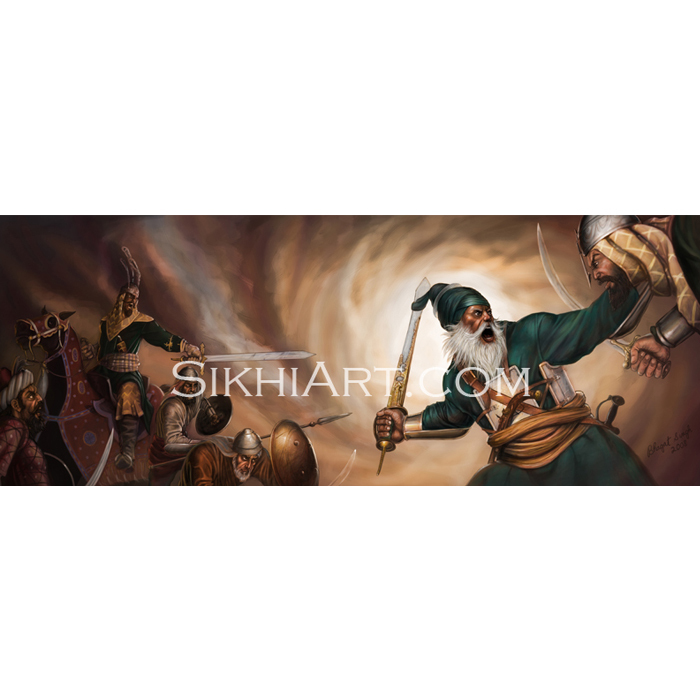 Thus the Khalsa, the pure, were born, ready to defend the sikh nation, ready to fight for the oppressed! 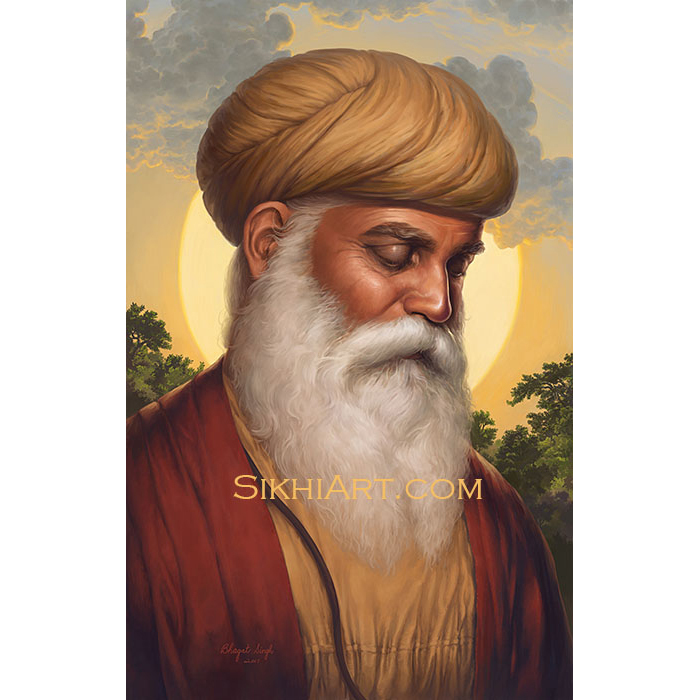 That both the Khalsa and the Victory belong to the Wonderful Guru! To purchase prints of this iconic event, click here. At first glance the image appears not of guru sahib but of a mugal from dress and from features of image. 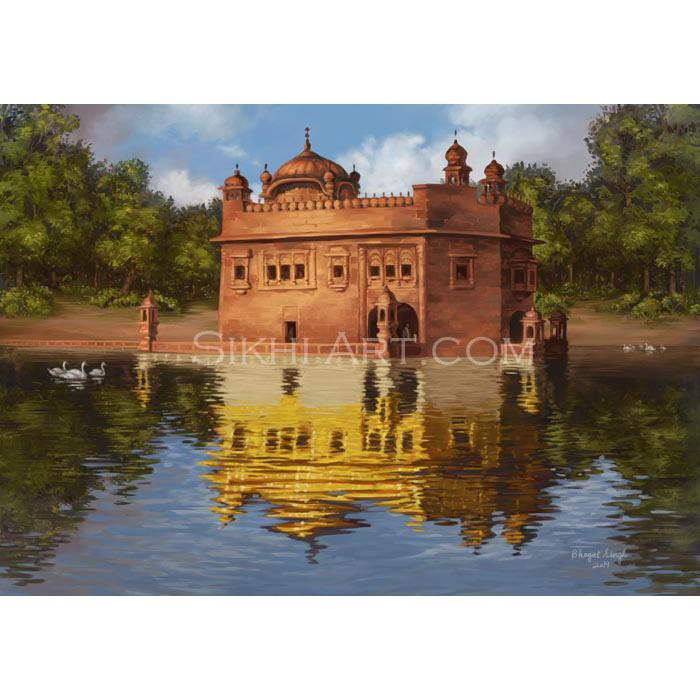 It gives us insight about the painter who claims to b Sikh but know nothing about Sikh culture . In this painting, I have shown Guru sahib wearing a puratan dumalla and chola. This is the type of turban and clothing that we see him wearing in his puratan paintings from 1600s, 1700s and 1800s. 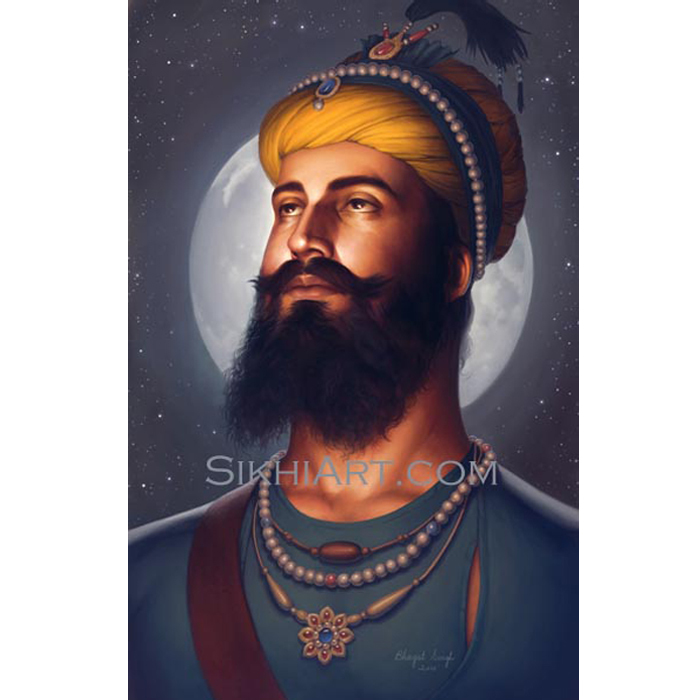 The turbans we see sikhs wearing today – the modern nihang dumalla styles, the Pataiala shahi turban styles and the Uk turban styles – did not exist at the time when Guru ji was alive. 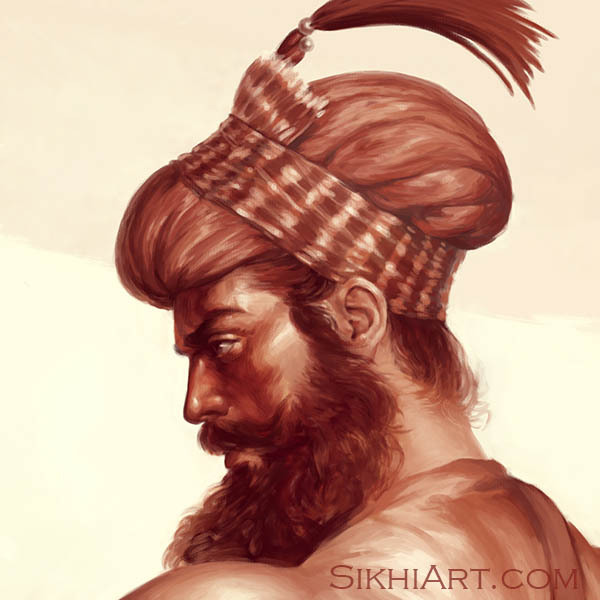 As for his face, the inspiration I got from Waheguru was to make him look strong, serious and threatening – that is to say – he should look intense. 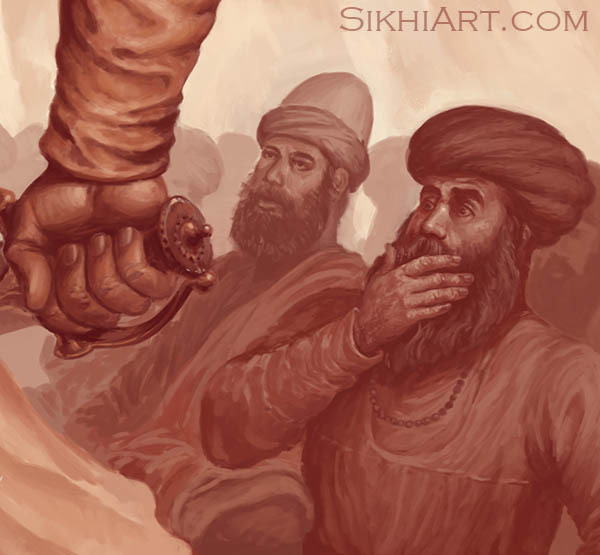 Guru ji pulled out his sword and asked for his sikhs to sacrifice themselves right there and then on a happy occasion. The sikhs got scared and thought their spiritual leader was crazy to ask for human sacrifice. So Guru Sahib’s face reflects this intense moment. This is a beautiful painting reflecting the artists interpretation of events. We are usually presented with images of Guru Ji looking ambivalent. However we must remember the context of 1699. Guru Ji’s followers were literally fighting for survival, the Moghul rulers had spread terror throughout. Guru Gobind Singh must have been a fierce and stern individual in order to command a rebellion against such tyranny. I believe that comes across in this image. Guru Ji is asking members of the sangat to die for the cause.. imagine yourself standing in the sangat that day. These were serious times requiring a serious leader. 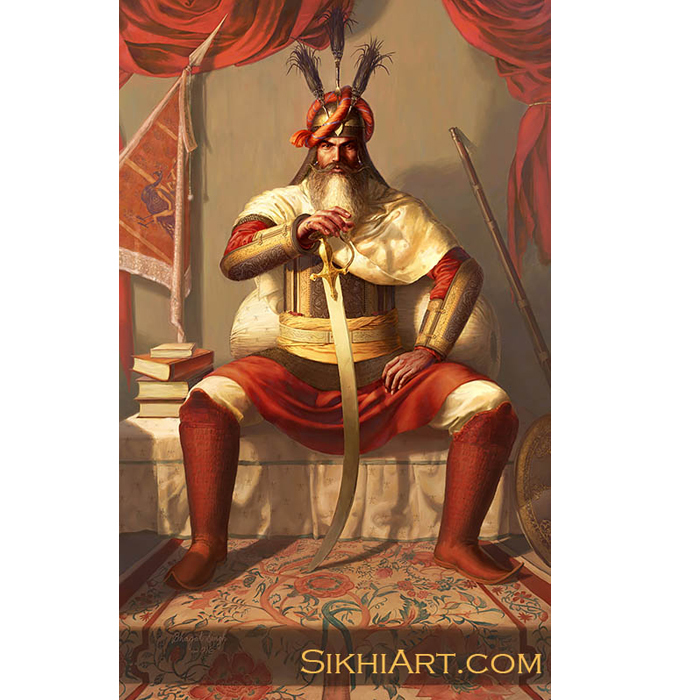 There are many groups who seek to deny the martial and political aspects of Sikhi. Many of them were initially created by the British to divide and conquer martial races within the colonised lands. The Radha Swami’s are an example. We must be wary of fabrication and denial of our heritage.